If you're anything like me, then your New Year's resolution to workout more has probably fallen by the wayside. I actually don't mind working out. I just hate the gym. They all smell like rubber mats and sweat and are usually ugly. I remember seeing the gymnasium at Biltmore House above when I was young and thinking it looked beautiful. 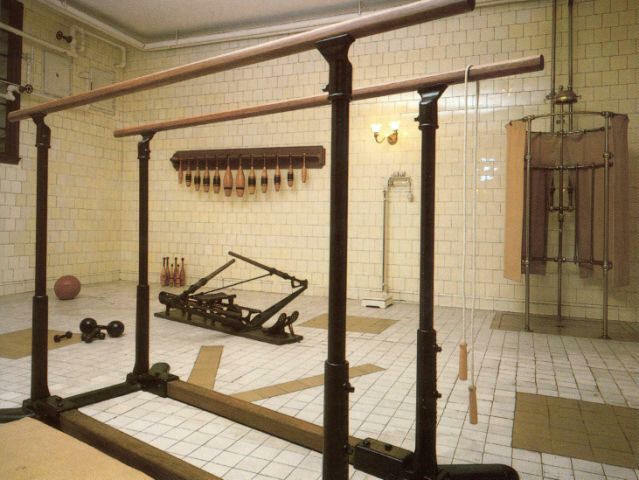 I love all the wooden exercise equipment and weights. In our age of sustainability and eco-friendliness, why are we not making more workout equipment out of wood? Vogue editor Tonne Goodman works out on a wood rowing machine. This is the epitome of chic to me. I found it online at WaterRower. You can thank me later. 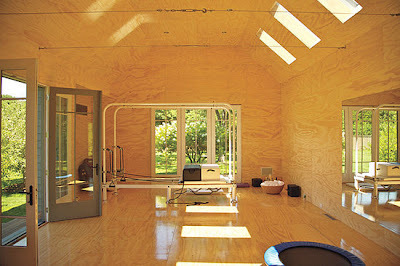 Interior designer Christopher Coleman designed this stylish home gym. Of course, if I had couches in my gym, I would probably do more lounging than exercising but that's just me. 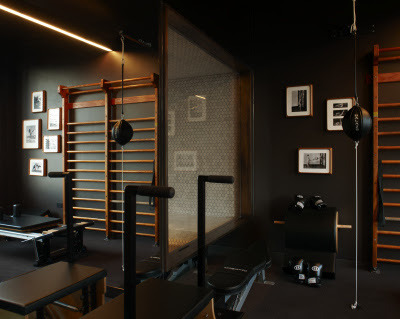 I don't have a credit for this home gym but I like the wood mixed with the dark walls. 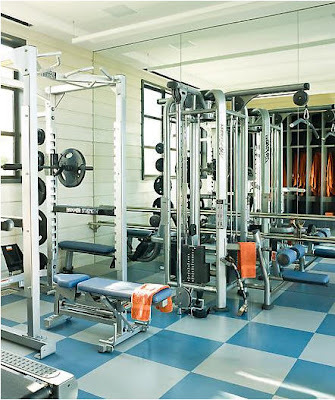 Most gyms have unflattering bright overhead lights. If they can turn the lights down for yoga, why can't you workout in low lights. I think a lot of people would appreciate not seeing how out of shape they are at the gym! UPDATE: One of my kind readers pointed out that this gym was designed by Bonetti Kozerski Design for Andre Balazs. No wonder I liked it so much! 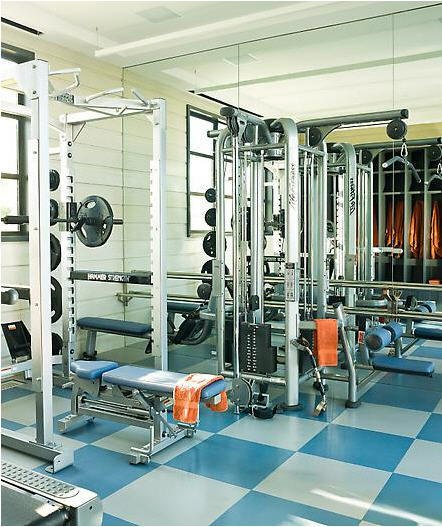 Steven Gambrel designed this bright home gym. Don't even get me started on workout clothes. Not sure you should pump iron in couture and high heels but it's a lot chicer than most of what's available. I especially hate that sneakers for women are usually pink, purple or teal. The Rolls Royce of workout equipment is the Kinesis Vision by Technogym. For as much as they cost, it better come with that hot guy to teach you how to use it! If you've ever taken a walk in Central Park and almost been run over by a serious cyclist, they you know how many people are into this sport. If you want to bike in the comfort and warmth of your own home, then the Tacx Fortius Cycling Trainer is for you. Personally, I don't think anyone should wear an outfit that tight in public anyway. You could also take a run in heels but that's probably not advisable unless you are trying to catch a cab. If meditation and yoga are more your speed, you could create a yoga room like Jennifer Post. She designed this room to also double as a spa space for the Kips Bay Decorator Show House this year. Gwyneth Paltrow created an entire workout studio in her pool house. She works out with Tracy Anderson who also works out with Madonna and other celebrities. Her DVD's are currently collecting dust on my shelf so maybe I should try them again. The Tracy Anderson Method is clearly working for Gwyneth. Diane von Furstenberg is 64 years old and yoga is the key to keeping her looking and feeling young. She practices on the roof of her building. 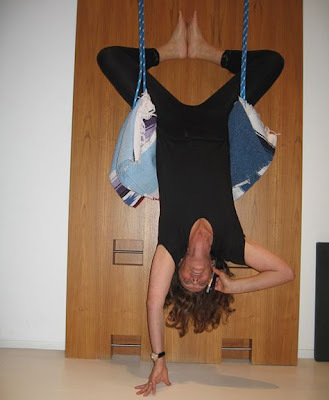 She also takes business calls hanging upside down. I'm sure I'd fall on my head so I think I'll pass on this one. 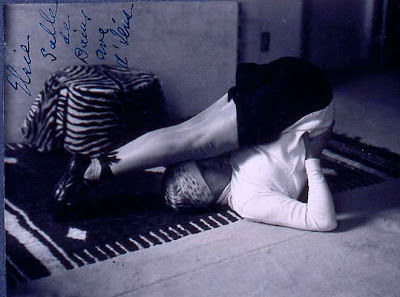 Interior designer Elsie de Wolfe was famous for her morning exercises. She wrote in her 1935 autobiography that her daily regimen at age seventy included yoga, standing on her head, and walking on her hands. If she could work out at 70, I think the least the rest of us can do is take a walk! Note to self, buy a workout turban. I wouldn't mind taking a page out of Donna Karen's book so I could work out with this hunky yoga teacher. Nuff said. Remember that it takes three weeks to get used to a new routine. If you fall off the wagon, just pick yourself up and try again. Even small changes will make a difference and will make you feel better physically and mentally. Shopbop on Sale and $100 Giveaway! Inspiration on the Skirted Roundtable This Week! Hope you are staying wrapped up!